Segmental neurofibromatosis is a rare genodermatosis secondary to post zygotic somatic mutation of the NF1 gene. It may be accompanied by neurological and skeletal complications. We report the caseof a 13 years old child with bilateral segmental neurofibromatosis on the thighs and legs. Clinicalmonitoring was proposed each year and genetic counseling was lavished. Segmental neurofibromatosis a rare genodermatosis characterized by segmental symptoms. We report a case who presented painful and bilateral nodules arranged in series. The child HJ, 15 years old, consulting for non pruritic painless swelling localized at gradually lower members that increasein size since 13 years old. The patient had no notion of consanguinity or similar cases in the family. Clinical examination found multiple subcutaneous bilateral nodules with a facing skin flesh-colored, grouped rosary on the thighs and medial sides of the legs. The rest of examination shows both lentigines and coffee with milk spots localized in the left flank without axillaire location (Figures 1-3).There was no plexiform tumors or osteo-articular abnormalities or ophthalmic neurologiques signs. Ocular examination didn't found Lisch nodules. We discussed the diagnosis of schwannoma, a rare lipomatosis or variant neurofibromatosis. Ultrasound soft tissue revealed multiple tissue pictures dented measuring 20mm to 36mm in diameter, resembling to a nervous origin. 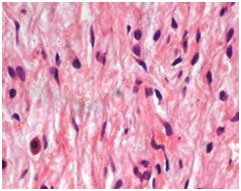 The Histopathological exam of the nodule was in favor of a neurofibroma (Figure 4). The brain scan andX-rays of long bones have not objectified anomalies. Segmental neurofibromatosis was detention. Clinical monitoring has been proposed every year. Segmental neurofibromatosis is extremely rare: 0.0014 to 0.002%, with female predominanceat average 30 years old . This is a somatic mutation postzygotic the NF1 gene. The risk of transmission is very low (1 in 18 cases) [1,2]. Segmental localization is due to a phenomenon of late somatic mosaicism.Lesions are usually unilateral. The particularityof our observation is represented by the following atypical clinical appearance of bilateral lesions in a stringnerve pathway. Serious complications such as scoliosis, learning disorders, hematologicalhave been reported . The care of patients is not codified. In absence of a study regarding therisks involved in the case of segmental neurofibromatosis, it seems justified to provide an initial assessment andclinical monitoring. Genetic counseling should be done. Saurat JH, Lachapelle JM, Lipsker D, Thomas L (2009) Saurat (5thedn), Masson France. Allanore L, P. Wolkenstein P (Eds. ), Neurofibromatosi: 10,4. Sobjanek M, Dobosz-Kawałko M, Michajłowski I, Peksa R, Nowicki R (2014) Segmental neurofibromatosis. Postepy Dermatol Alergol 31: 410-412. ©2015 Abdou A. This is an open-access article distributed under the terms of the Creative Commons Attribution License, which permits unrestricted use, distribution, and reproduction in any medium, provided the original author and source are credited.